Boulder, Colo., USA: Yosemite National Park contains some of the world's most iconic landforms, including Half Dome, Yosemite Falls, and El Capitan. Although the cliffs of Yosemite Valley may appear static, rockfalls from these cliffs are common, with a rockfall occurring every four to five days on average. Rockfalls are key to shaping this iconic landscape but also pose risk to the four- to five-million visitors to the park annually. Open-Access URL: http://www.geosociety.org/gsatoday/groundwork/G374GW/article.htm. CONTACT: Greg Stock, greg_stock@nps.gov. GSA Today articles are open access online; for a print copy, please contact Kea Giles. Please discuss articles of interest with the authors before publishing stories on their work, and please make reference to GSA Today in articles published. 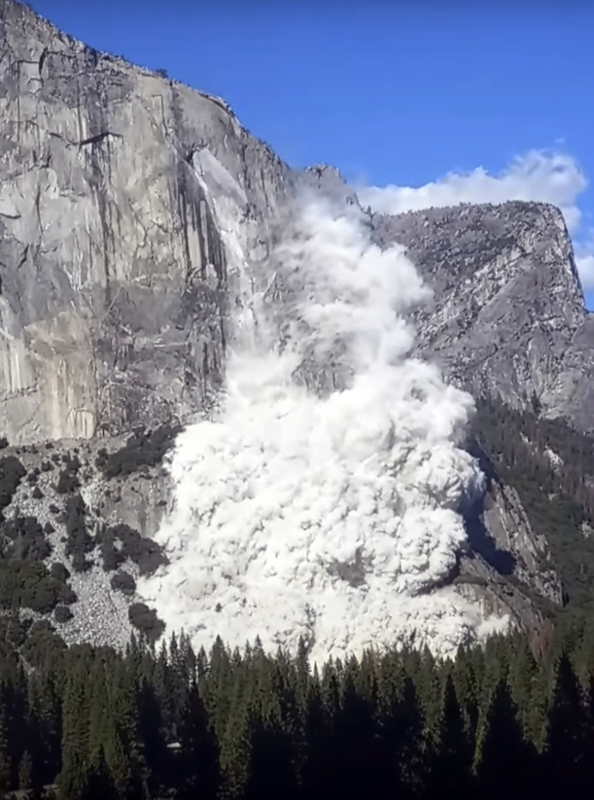 28 Sept. 2017 rockfall at El Capitan. Photo by Przemek Pawilkowski.